Boy Jones Jr says he is feeling fitter and stronger than ever after making the jump from Super-Featherweight to Lightweight. The former Southern Area 130lbs Champion returns to the ring on Frank Warren’s bumper ‘Untouchables’ card at the Copper Box Arena on Saturday 10th February and is aiming to impress at his new weight. “My body is finally starting to fill out and I felt it was the right time to move up to 135lbs,” said Jones Jr. “I sat down with my trainer Dominic Negus and it was an easy decision to make. I had a lot of success at Super-Feather but my power just seemed to drain from my body as soon as I made weight. “I’ve had a good break since I last fought in September. I’m filling into the weight and getting stronger with each session in the gym. I look better and I feel healthier – my mum has wanted me to move up in weight for a while! 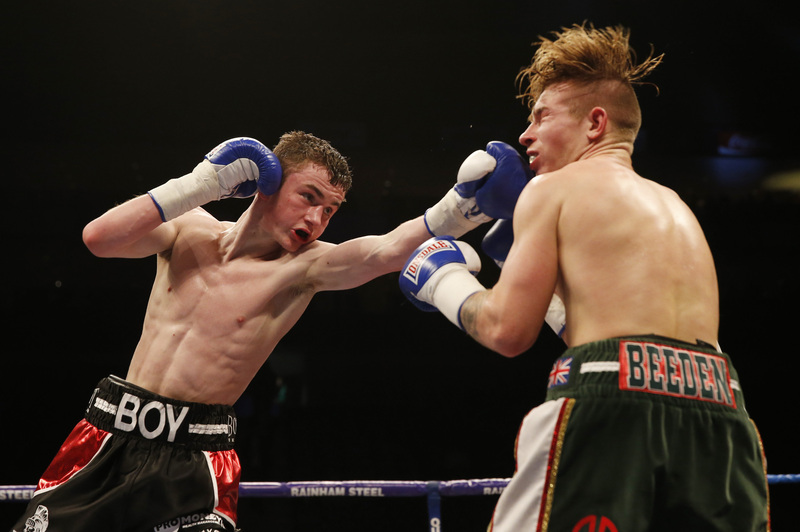 The angel-faced assassin picked up his first professional title at the tender age of 19 when he dominated Martin Hillman to win the Southern Area belt in front of a capacity crowd at the Brentwood Centre, live on BoxNation, in November 2016. He suffered his first career loss to Lowestoft warrior Craig Poxton in his next fight at York Hall in a Fight of the Year contender but bounced back with wins over Norbert Kalucza, Andis Didzus and Ibrar Riyaz, and will aim to kick-start 2018 with a big performance in East London. “One of the most talent deep divisions at domestic level is the Lightweight class and I’ll be looking to throw my name into the mix. There’s some great fights out there for me this year but first of all I can’t wait to perform at the Copper Box Arena on February 10th. Four of the most avoided fighters in the United Kingdom return to action at the Copper Box Arena on February 10th, live on BT Sport and BoxNation. Ilford Light-Heavyweight ‘Beast’ Anthony Yarde will be aiming to pick up from where he left off in 2017 after becoming the first man to stop Nikola Sjekloca with a heavy-handed display last weekend which lasted less than four rounds; Heavyweight sensation Daniel ‘Dynamite Dubois is determined to start 2018 with another explosive KO after his two-round destruction of Dorian Darch; British Welterweight Champion Bradley ‘Super’ Skeete is ready to prove his World class credentials as he looks to entice one of the 147lbs Champions into a showdown in 2018 and WBO Bantamweight Champion Zolani Tete makes the second defence of his crown against former two-weight World Champion Omar Andres Narvaez. Some of the best up-and-coming talent in the South feature on a talent-packed undercard. All-action Welling Super-Featherweight talent Archie ‘Sharpshooter’ Sharp aims to improve his unbeaten record to 12-0; gifted Southampton Featherweight Ryan ‘The Piranha’ Garner looks to get his career back on track when he fights over four rounds; Ilford Welterweight Hamza Sheeraz returns to the scene of his impressive TKO debut win over Duane Green; stylish Ilford Super-Middleweight Umar Sadiq and Chigwell Flyweight Harvey Horn both look to go 2-0 while Beckton Lightweight and Anthony Yarde gym mate Mohammed Bilal Ali makes his professional debut. Tickets priced at £50 (Lower Tier), £70 (Floor), £100 (Floor), £150 (Floor) and VIP/Hospitality £250 are available via See Tickets, Eventim and Ticketmaster.